Buying and selling simultaneously is all about the timing. Although it is common to buy and sell a home at the same time, buying a home before selling your current home is quite difficult, unless you are one of the rare homeowners with the financial ability to pay two mortgages at once. The home buying and selling process can be time consuming overall, but you should expect to sell your current home before you purchase a new home. Many other homeowners have done exactly the same thing, and so can you. 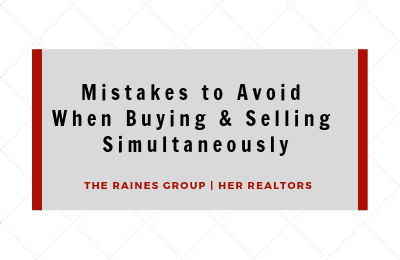 Listed below are some tips to avoid making a mistake and help you succeed as both a buyer and seller! Buying and selling at the same time can be complicated and a bit overwhelming, so it is helpful to have a professional agent with experience and knowledge right by your side. A knowledgeable, local agent will not only be able to help you determine the market value of your home, but they will also be able to talk you through the timing and process. Your agent should be able to answer all your questions about the process and help to negotiate the perfect listing price. The length of time it takes to buy and sell can vary tremendously depending on the local real estate scene and the current market. Every home needs some touch up work before selling. Whether it is repainting some scratched walls, updating light fixtures, installing new carpet, or repairing a broken deck. Don’t wait until the last minute to initiate this process, otherwise you could find yourself rushed and miss out on a home sale. When you’re buying and selling simultaneously, the number of moving parts doubles. And if any of those parts become immobilized, it can throw off both of these transactions. It is always best for you to have a backup plan in case something goes wrong. Keep your emergency fund well-stocked. In a best-case scenario, you may simply need a hotel or Airbnb for a week, but in worse scenarios you may also find yourself looking into a short-term rental. Always have cash on hand, in addition to your down payment funds, to prepare for the worst scenario. A major mistake that we see from simultaneous buyers and sellers is making the same one that many first-time buyers make: they fail to get pre-approved on their new loan. Getting pre-approval is an important part of this process because it puts a stop to an unrealistic fantasy by telling the buyer exactly what size of house they can afford. Many buyers assume that with a large down payment and increased income, they will automatically qualify for a larger home loan. Since buying a home is a huge investment to your time and money, it is important to not add to your current debt by incautiously purchasing pricey items, from new furniture or a new car, to hiring contractors to remodel the home. It is recommended that you save your purchases for a few months after closing your home to regain your financial stability and see the layout of your new home. This allows you to see features of your new home and what rooms will need new furniture. Oftentimes it is very tempting to purchase new furniture before you move out; nonetheless, it is best to wait until you have paid off all of your credit card bills and regained financial stability. Once your home has been closed, then make these purchases since new debts can affect your credit score negatively. When you use your credit card on an expensive new purchase or new line of credit, you can harm your credit score, delaying the ability to close your home as a result. If you have any questions about buying and selling a home simultaneously, give us a call today at 614.855.8700!